WAFFLES: Boss! I think my head is starting to tip over! WAFFLES: I'm afraid to move, Boss. What am I going to do? Aren't we supposed to be fighting crime and stuff? Isn't that what Mod Squad Cats do? KATIE: Don't worry about it, Waffles. I think you'll probably scare all the criminals away with that wig. WAFFLES: So Boss... *whispers* Don't look, but there's another cat in our picture. Do we need to arrest him? Or is he undercover too? KATIE: Well first, she's a SHE. Her name is Zeru. And second, everyone knows there were three characters in The Mod Squad. You're Linc with the big hair and glasses. I'm Julie, the BEAUTIFUL blonde who ALL the mancats were in love with. And Zeru here is Pete. WAFFLES: But you said Zeru was a girl! KATIE: Yeah, well being a boy didn't stop you from playing Laura Ingalls Wilder. And the hills were alive and just fine with you as Julie Andrews. ZERU: Uh, hello? Excuse me. I'm here looking for a forever home and I'm just wondering what I'm supposed to do? They gave me this leather vest thing and told me to just stand here and look cute. Uh, no one said anything about a wig though. WAFFLES: Hey wait a minute! Where'd everyone go? Announcing TV Trip Saturdays with the PAWS Shelter Cats! Our Saturday spoofs just got a whole lot furrier! Each week an adoptable cat from PAWS Pet Animal Welfare Society will be making a cameo appearance in our TV Trip blog series. Through the magic of Photoshop, they'll join Katie and Waffles in their TV time-travel adventures. We'll also introduce you to the cameo cat and share a little bit about them. Maybe, just maybe... some silly wigs and special effects will help our shelter friends find forever homes. Special thanks to our partner in crime, Maggie Swanson, the photographer behind our cameo cats and a devoted volunteer at PAWS. Maggie is the author of the blog, Sundays at the Shelter, where she features adoptable cats from PAWS each and every week. Her beautiful photos have helped countless homeless cats find loving homes. Zeru is a sweet and affectionate 8 year old girl cat. She's got a cute and compact body and a BIG friendly purr. She loves people... but other cats? Not so much. Zeru probably doesn't realize Katie & Waffles are even cats, what with all that hair. Zeru is available for adoption at PAWS, Pet Animal Welfare Society in Norwalk, Connecticut. Zeru's photos by Maggie Swanson. What a great way to promote adoptions! And than COD you're not doing the "Mod Squat", MOL! Zeru looks like a real sweetheart! My human has a weakness for calicos. But since we don't live in Minneapolis, we should not forget the local shelters! Pawsome idea!!! Waffles will tip over now! MOL! I love this post! When I emailed Zeru's photograph to Glogirly, I had no idea what she'd do. It's funny, inventive, and I sure hope it leads to an adoption! Thank you, Glogirly, Katie, and Waffles for sharing the spotlight. That's a great idea. I hope Zeru gets adopted soon so she can move out of Waffles afro. Those wigs are amazing, Katie and Waffles. Zeru, we are so glad to meet you, and we hope you find a good forever home really soon. How exciting and what a great idea! What a cutie you are, Zeru! We are so happy that Glogirly is working with our pals at PAWS! We love their adoptable kitties and this will help even more kitties find furrever homes..Three of us from Squeedunk were rescued from the streets and two of us were given to Z-Girl just before we were to enter a shelter--so we know the importance of finding good, loving furrever homes just like you do at the townhouse. Pawsome work, Mod Squad! That is a fantastic idea! I look forward to seeing more of these. 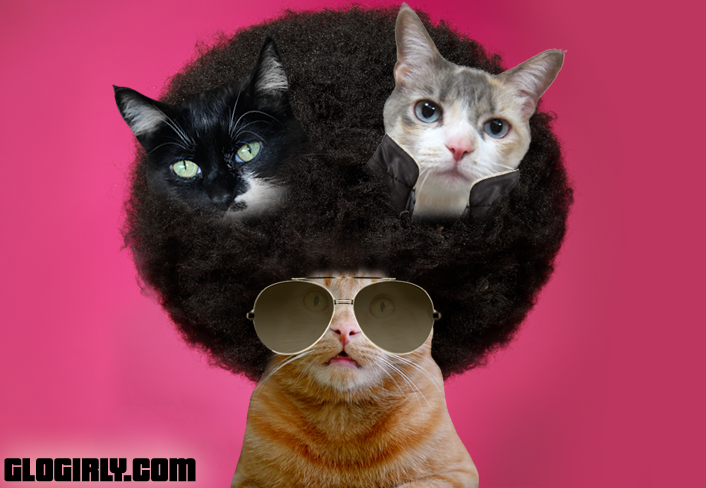 Waffles, you're rockin' that fro!!! And Katie, I think all the man-cats are in love with you, blonde hair or tuxie!!! That is a far better idea than Waffles' hair... Just saying. Oh my word we fell out of the chair over Linc Waffles. What a wonderful thing to do to help the kitties find homes..I look forward to meeting more kitties every Saturday..Katie..tip Waffles over..mol..go on girl..sneak up and give him a push..MOL!!! What a gweat posty. Weez shawin' an purrayin' miss Zeru gets a furever homw soon. Weez eat in diffewent places too. Noot fur da same weasons as y'all tho'. And amazinly enuff, weez didn't see any Apwil fools spoofs till they stawted appeariin' on blogs. MOL Hope y'all have a wunnewful and blest Easter. OMC! Waffles, could your hair get any bigger?? The mom calls us three the Mod Squad. ;) We think it's cool that you're gonna feature some of the shelter kitties! 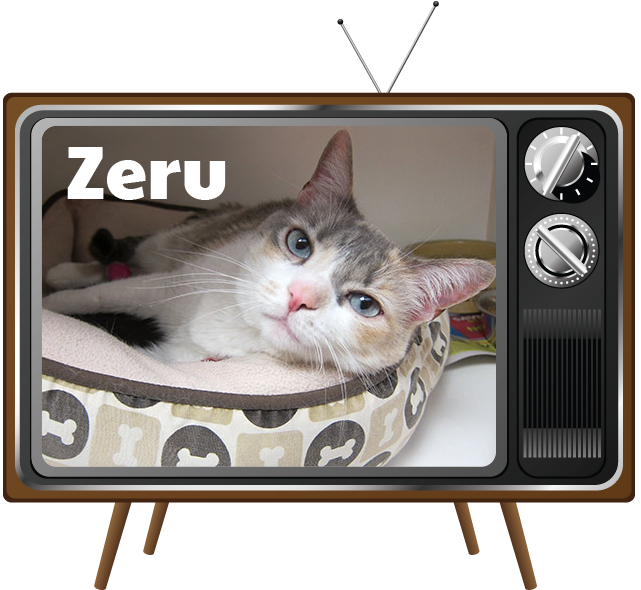 What a creative way to get the word out about Zeru, hope she finds a home soon. That is a super wonderful idea! Great idea, giving a cameo to a cat who's looking for a furever home. 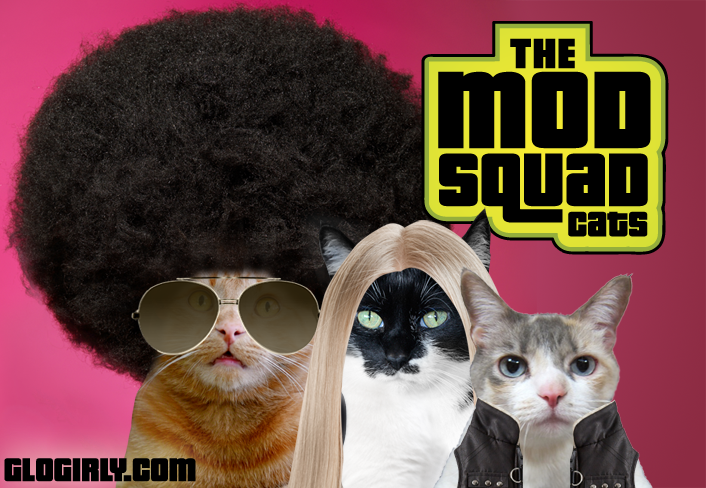 Yay for kitty Mod Squad! I gotta tell you I got an alibi. I hope Zeru is adopted by the time I get to the Z’s. What an afro you got their Waff/Linc! Hope Zeru finds a home soonest. We're MOL @ the afro. We hope Zeru's forever home finds her soon.